Matchbook currently available on eBay: item 330586281085. Today it's that turreted building that says "RESTAURANT" but isn't, which I always find a bit depressing. Not a fan of repurposing purpose-built buildings, nor of nonretail uses at street level, but there you are. I suppose it's better than nothing. Scott, you might enjoy some of the pics of Howey's we've posted in the past. 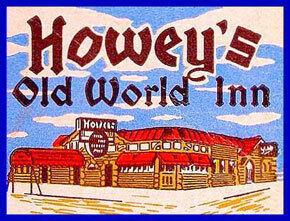 You can see an old postcard view and a few photos here: Howey's.